Click the above logo to be taken to CitySpree. CitySpree is a restuarant delivery service that we are proud to be a partner with! Just click the logo and you will be taken to the Italian category. Pick your nearby Santino's location and place your order! Hot and delicious food will be en route! Note: Santino's locations do not personally deliver except for catering. Please use CitySpree for personal delivery. Please click on a menu category to see the contents. Our delectable toppings come from a variety of different places. You'll find everything you need to complete the perfect pizza, but don't stop there! We're open to putting our toppings on any food item you wish. Prices will be on each category's page. The classic and delicious, cheese pizza. What makes this original so much better than just being a cheese pizza? It's baked using our homeade pizza dough - always prepared in house. Thinking about being adventerous? Add any toppings you'd like! 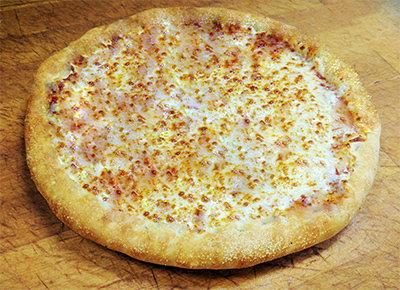 Gluten Free: Currently, we offer only our 12" crust in gluten free. You may order any pizza with a 12" gluten free crust. There is a $3.00 upcharge. Uses barbecue sauce as a base. No pizza sauce! Uses buffalo sauce and ranch as a base. No pizza sauce! Uses garlic butter as a base. No pizza sauce! Uses Greek vinaigrette as a base. No pizza sauce! Bring out a sweet and salty sensation with this coastal treat. Uses olive oil as a base. No pizza sauce! Uses salsa as a base. No pizza sauce! A grinder is one of our signature toasted sandwiches! With roots in the colonial period from Italian immigrants, the grinder obtains its name from what these immigrant chefs called the ship workers near the coast. We'd be honored to serve you one of these pieces of history! Choose between either pork or chicken coated in a sweet barbecue sauce. A signature grinder that combines the great flavor of beef and horseradish! (Formerly Roast Beef Combo) Combine your roast beef craving with a little more! Bite into a more exotic flavor with this mediterranean inspired meal. Steak has never tasted so good! Topped with teryaki glaze and pineapples to feed your sweet tooth with an astounding alternative. Jammed packed with so many meats there is no way this won't leave you feeling accomplished! Try our deliciously-seasoned pizza sauce on amazing in-house baked bread! Packed with flavor and spice. Bite into a delicious mixture of southern chicken salad spread over our signature bread! Philly-style sliced steak coated in white cheese. Spaghetti pasta noodles and sauce with a thick layer of white cheese. Includes a half order of garlic cheese bread. Two ricotta cheese filled pastas, served with a half order of garlic cheese bread. Stuffed full with any two toppings you'd like. White cheese and a delicious layer of our pizza sauce included already! A 12" pizza dough spread out, filled with your favorite two toppings, then rolled up. Sauce and cheese is layered inside and included in either prices. You can choose to add your own toppings or use one of our speciality pizzas. Any additional toppings are $0.89 ea. Looking for something with more to it? Try our specialty salads listed below. They come in half or full sizes. All salads use a romain and spring mix lettuce blend; however, you are welcome to specify you only want one type of lettuce. Please let the cashier know which lettuce you'd prefer if you do not want our house blend. La Nova chicken wings. Baked in our oven, then dipped into a sauce of your choice. Sauces available are garlic parmesan, hot, teryaki, barbecue, or honey mustard. Served with a side of ranch or bleu cheese. Fluffy bite-sized snacks! These are put through our oven after being lightly coated with garlic butter and garlic parmesan seasoning! Your choice of garlic butter or marinara sauce on the side. Nobody can go wrong with taking an order or two of our best appetizer. Savory garlic spread coated along our house made bread. A warm treat served with your choie of marinara, garlic butter, or ranch on the side. A bed of salted chips covered with seasoned taco meat. You'll get a generous amount of diced tomatoes, cheddar cheese, sliced onions, and black olives. Finalized with crisp lettuce, salsa and sour cream. The best kettle-style chips the south has to offer. These are the perfect complement to your meal. We offer many flavors including barbecue, regular (salted), and more. Rich, chocolatey brownies with semi-sweet morsels inside. Cinnammon flavored bite-size desserts. Before we cook these in our oven, we make sure they are covered with a layer of butter and then finished with a coat of cinnammon sugar. Otis Spunkmeyer brand cookies. Jam packed with chewy goodness and exploding with sweet flavors. A styrofoam to-go cup marked with our store logo. Enjoy the leisure of using this cup in store and when you leave! Ice cold Dasani bottled water. Santino's Pizza and Grinders (hereby referenced as Santino's) is property of Wardster Inc. Santinospizza.com (hereby referenced as the "website") is a website owned by Wardster Inc. Any assets or images displayed (not including the Locations page) on the website are property of Wardster Inc.
Santinospizza.com is a website created by Garet C. Green.